Oceanco has launched another superyacht - project Y708 was spotted in Rotterdam yesterday where she had been discreetly towed. 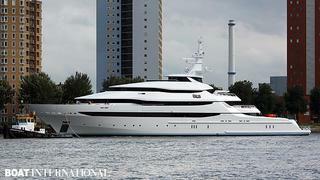 Y708 is the second superyacht to be launched by the Dutch yard this year, the first being Nirvana. Y708 has a length of 85.6 metres. Her hull was conceived by Azure Naval Architects and the yard's in-house team, while her smooth exterior design is by Igor Lobanov. Her hull arrived at the yard in mid February 2011. Few details are known about her interior for the moment, but she purportedly accommodates 14 guests in a master suite and six further guests cabins, configured as two VIPs with private balconies and four doubles. Y708 will be powered by twin MTU engines from the 20V 4000 M73L series. Producing 3,600kW each, they are projected to achieve a top speed of 20 knots. Y708 is now scheduled for delivery before the end of the year.